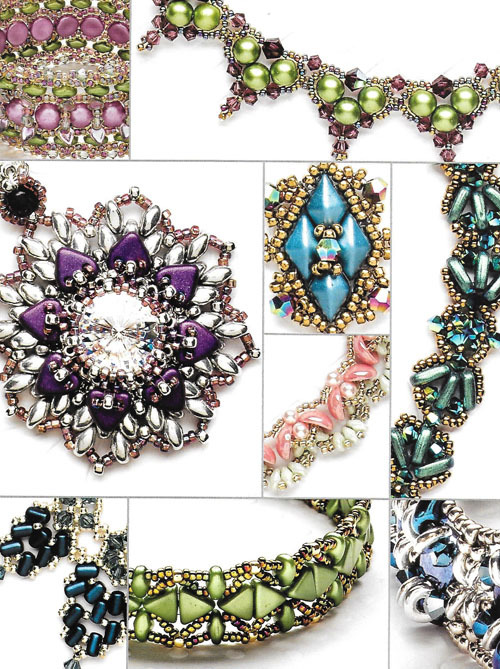 The last few years have seen an explosion of all sorts of unique multi-hole beads which have delighted beaders everywhere. Clearly the Czech bead manufacturers are on a roll. But inspirational tutorials on how to use them still lag behind the myriad bead types now available. So I was intrigued when I received Exquisite Stitching with Multi-Hole Beads from Kalmbach Publishing for review. The designer and author, Renee Kovnesky, is a seasoned bead instructor behind the Etsy store, Elegance by Renee. What she did was select 25 different kinds of multi-hole beads and created 25 original designs with them. Interestingly, she also grouped them into 5 categories based on their general shapes as shown in the chart below. I thought the round Piggy and cone shaped Tipp beads could have swapped positions but it is a minor point in what is an excellent selection of popular beads as well as some lesser known ones. The designer clearly saw the potential in the latter. The book contains necklaces, bracelets and earrings but no ring designs. A few of the designs are simpler in construction but all are within the capabilities of most beaders. I have chosen some of my favorites from this book. What struck me was the designer's love of color. 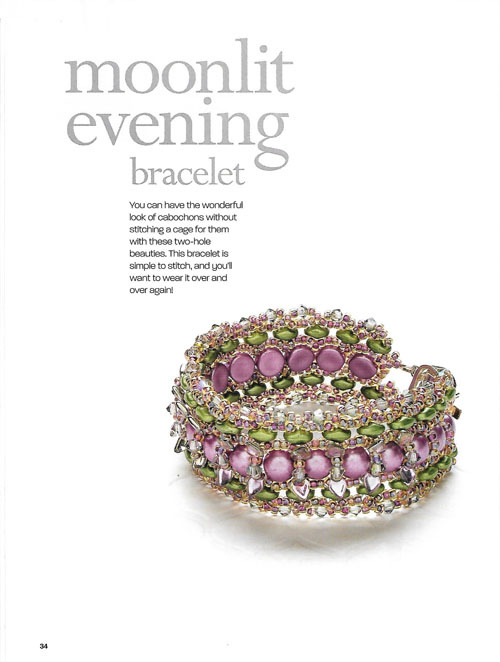 The Moonlight Evening bracelet is a fine example of how greens and purples go well together. Plain two hole Cabochon beads combined with dragonscale beads - the latter was not included in the chart - and crystals made this design pop! 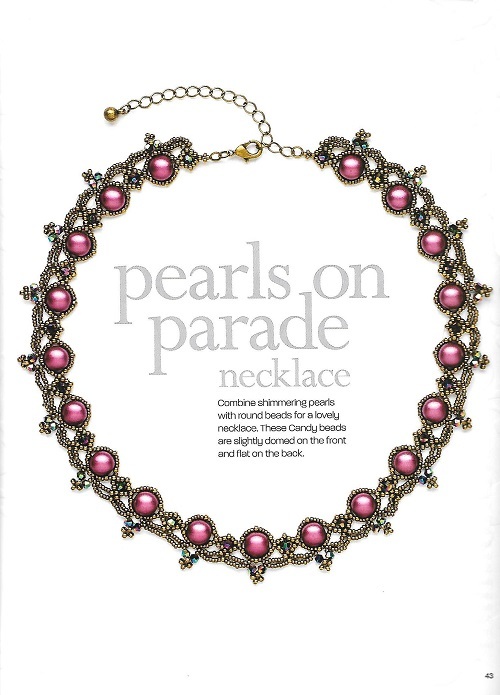 The Pearls on Parade necklace uses double holed Candy beads. As these beads are flat on the bottom, the necklace will have better contact on the skin than round pearls would. 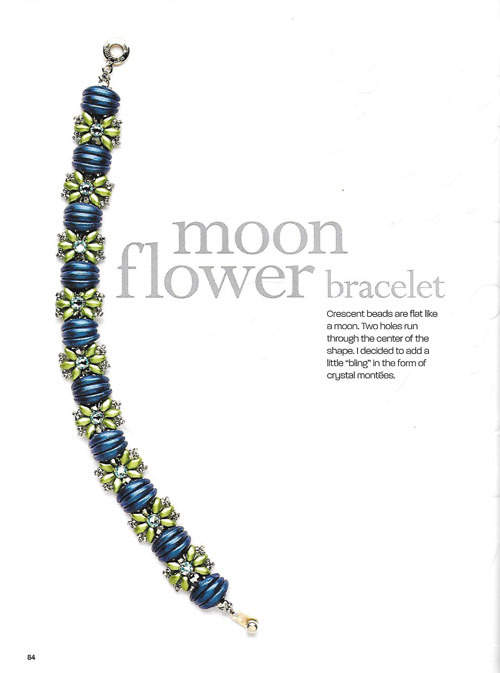 The Moon Flower bracelet shows this designer's creativity. Here she grouped Crescent beads for a bold look. Who would have thought that Piggy beads - so named for the snouts of these farm animals - could be instrumental in the creation of the really pretty Sweet Pea necklace? The double holes of these beads are not visible in the finished design so the beads resemble pearls. You could not create a design like this with ordinary round single hole pearls. The creativity of the author is outstanding. 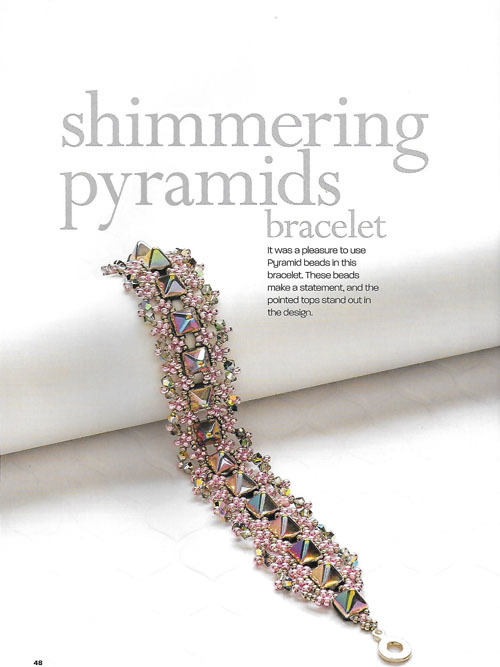 The book contains so many inspirational and pretty designs, all of which are sure to send beaders hunting for the featured beads in their favorite bead stores. A worthy addition to beadweaving libraries. If you are in a beading rut, then this book is for you! 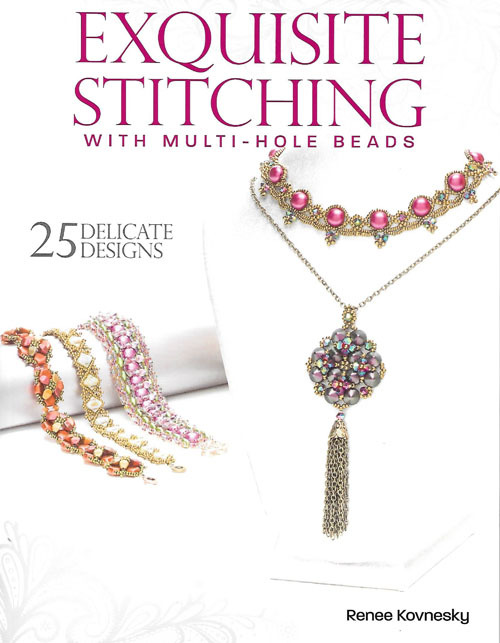 If you'd like to win this giveaway for a copy of Exquisite Stitching with Multi-Hole Beads, please make a comment below. Make sure you leave contact info below if you do not have an online shop or blog. It ends in a week's time at 6 pm EST Monday, January 8 , 2018. I will pick the winner randomly and announce the results as soon as possible after. So be sure to leave a contact email if you don't have an online link or make sure you come back and check! Otherwise I will redraw in a week. Good luck! 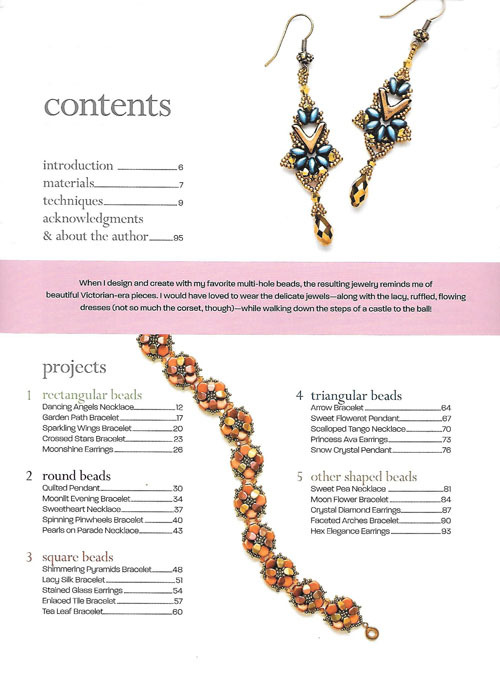 Oooohhhh...This looks like a lovely book with lots of great ideas for using some of the newer bead shapes. I always look forward to your blog & your Facebook posts. Thank you so much for all you do for the beading/jewelry community. Have a wonderful 2018, everyone. Should I be embarrassed to admit that I have multiple colors of every one of those beads (and a few shapes not pictured, as well...)? I love the multi-hole beads!! This book looks awesome! Love the fact that these are delicate designs - just my thing!! Hope to own this book!! These are some of the most beautiful designs and pieces I’ve seen!! Would love to learn to make similar. I’m a blog follower, subscriber and facebook fan and can be reached at retro-grrl@hotmail.com. Awesome designs! 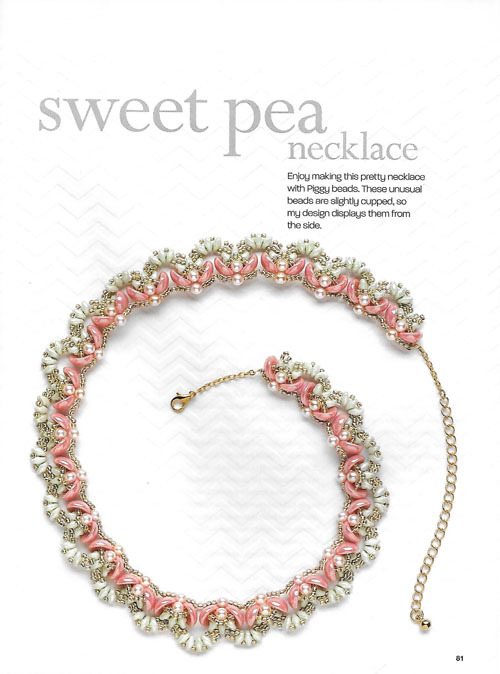 The Sweet Pea necklace is my favourite. I just wish the day had more hours! I love the challenge of working with multi-hole beads, and this book seems to incorporate more of the newer beads than other books. I would love to have this book in my collection. I love the designs in this book!!!! I would love to win this book!!!! Thanks for the giveaway!!!! These are beautiful patterns. I have bought several books of beading patterns and continue to find inspiration from them. 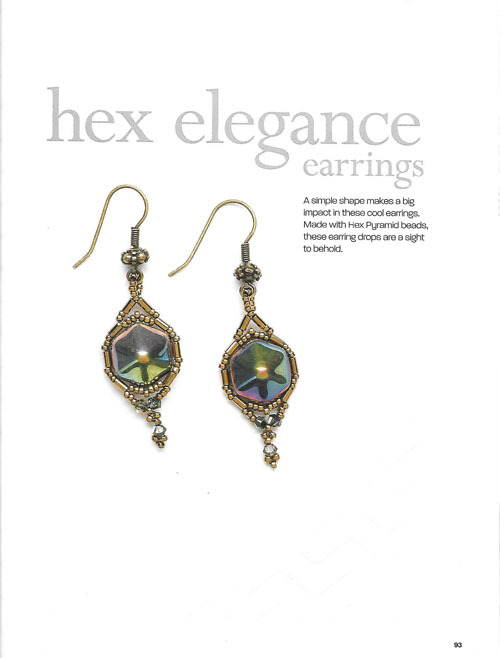 This collection looks to offer many wonderful designs. A beautiful collection. Beautiful! What a great resource! These designs are gorgeous. I would love to win this book. Great review! Lots of different designs in this book. This artist has created some delightful and new designs. I would like to have this book! Love the new variety of mutli-hole beads, this will be a great book! karlynr@gmail.com, I'm a subcriber/follower. I'm always pleased when a post from you shows up in my bloglovin feed. Beautiful, beautiful book - original ideas. Thank you for making this information available to us. I have so many beads that would fit in these patterns. Some help in knowing how to showcase them would be so appreciated, as I try simpler patterns that just don't really do them justice. Oh, I need this book! I’ve got several packs of multi-hole beads, duos and triangles, lying around and I’ve never been able to figure out what to do with them! Some truly lovely projects! I really want to up my bead skills this year, and this book would be a good start. Thanks for the chance to win. I love beading and the projects in this book are so beautiful. would really like to have this book. I am really getting into bead weaving—would love this! I’m also a blog subscriber. Thanks! I love working with multi-hole beads!! I have many in my stash, just waiting for inspiration. THIS would be perfect!!! What timing. A bead site has a sale going on. I went through her site and picked out one or two colors of every shape bead she sells. I decided I was going to find a pattern for each shape until I had used them all. Wouldn't this book be a perfect companion to my new challenge? Also follow you on Facebook, Google, Pinterest, bloglovin, email, :-) thanks for the chance to win. OOOH! Love these designs. Hope I win. Beautiful, unique designs-with some very interesting beads! I love the use of color combinations shown! Thank you for the review of what looks to be an awesome book. The designs in this book look exquisite. If I won the hardest part would be to decide which to do first. I would love to learn how to make these designs thanks for the chance to win this. I would love to learn more about beading with multi-hole beads!!! And being able to have a book in hand is so much better!!! Multi-hole beads are God's gift to beaders. The possibilities are mind boggling! Thank you for this opportunity Pearl and please keep up the wonderful work you do! I am a Blog subscriber. 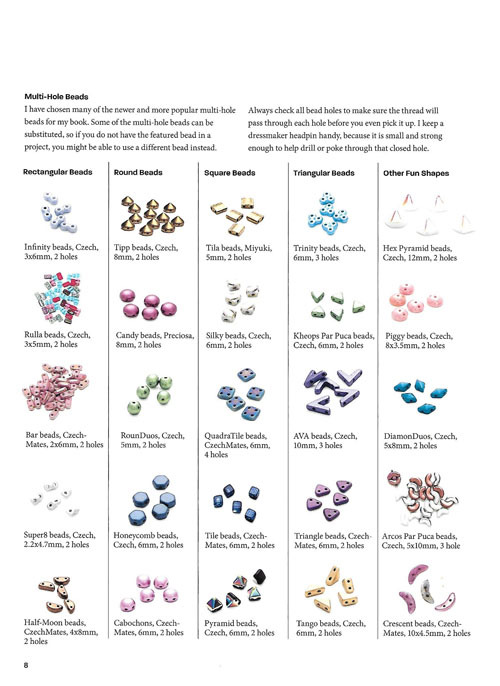 This would really help me to understand how to use the large variety of multi-hole beads now available. The designs are exquisite. I love them all. I'll pop back to see who wins. These designs are beautiful. I love seeing and using new techniques with new beads. This would be an awesome book to have. HI Pearl and Happy anniversary!. This book would be a help with my two-hole stash. Thanks. This would be an absolutely fantastic book to have, use, and participate in classes for. I am looking forward to having enjoying and sharing in the fun. I love the ideas with multi hole beads. Love to have this book. ***GASP*** I have a huge stash of beads for this book!!! I'd love to win this book!!! I would love to stitch some of these beautiful designs - Thank you in advance if I am the lucky person to receive this book. What inspirational work. I am a "newbie" to beading, but also definitely addicted! I could learn so much from the artistry in this book. Thanks! Love the sophisticated designs; Thank you for the giveaway.Just experimenting with diamond duos for the first time and would love to own this book. Facebook and bloglovin follower. contact is tigers628@hotmail.com. What else can I say but wow wow wow! !